The following pages were written with the dual object of furnishing a Sketch of my Grandfather's life and, at the same time, supplying a brief history of the Middle Party within the Church of Scotland which he led from 1842 onwards. The volume had its genesis in a lecture eighth of a series instituted to perpetuate the memory of Dr. John Macleod, the immediate successor of Dr. Leishman in the Parish Church of St. Constantine at Govan. For such a retrospect as is here attempted the time seems opportune. Exactly a century has elapsed since Matthew Leishman knelt on the clay floor of Govan Church to receive "the laying on of the hands of the Presbytery" and now that the tranquilizing mould covers the heads of all the chief actors in the Disruption period, while distance enables us to obtain a truer perspective, testimonies accumulate as to the value of the work done by the once maligned "Forty." For assuming the task of chronicler the writer may plead the possession of original documents, eked out by personal recollections of the central figure and his intimates gained in boyhood during several winters spent under the roof of Govan Manse and two golden summers at Sunnyside. For much valued assistance, rendered on special points, my indebtedness is gratefully acknowledged to various friends named in the body of the work. Thanks are also due to my kinsman, Charles B. Boog Watson, Esq., for family traditions and a budget of Matthew Leishman's college correspondence; to the Misses Samuel for letters of their grand-uncle, Dr. Simpson of Kirknewton; to Miss J. H. Duncan for the MS. Journal of Dr. William Muir; and to the Right Hon. 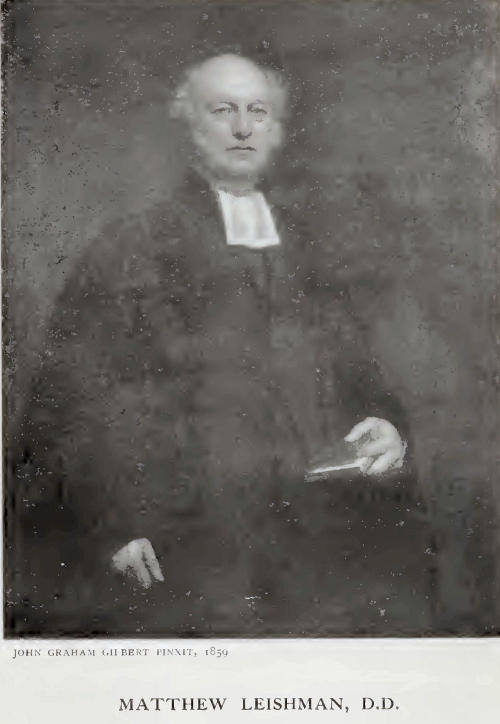 Lord Balfour of Burleigh, K.T., for access to a collection of interesting letters to and from his father, Robert Bruce of Kennet, touching the Church question. These acknowledgments would be incomplete without mention of my wife, whose ever -ready help in the transcription and adjustment of family papers has been of the greatest assistance. It only remains to express my very warm thanks to the Rev. Roger S. Kirkpatrick, B.D., whose varied learning and intimate knowledge of Govan have been of invaluable service when brought to bear upon the correction of the proof sheets.